A palm vein reader has been developed by Moscow software developer Aplana for TDSi, a United Kingdom access control provider. According to Aplana, there is now no requirement to physically touch the reader, which makes this particularly suitable for the hygiene-intensive healthcare and pharmaceutical sectors. The Palm Vein Access reader offers unprecedented levels of security without the traditional concerns and problems associated with biometric technologies. There is no requirement to physically touch the reader making this particularly suitable for the hygiene-intensive healthcare and pharmaceutical sectors. All of the main industry standard reader interfaces are supported allowing connection to the majority of access control units. 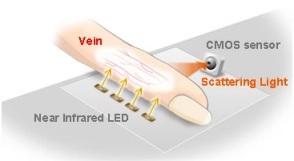 Palm vein recognition technology was developed by Fujitsu to combat the increasing incidence of financial fraud, plaguing many financial institutions in Japan. With ever increasing demands for accurate biometric identification tools, PalmGarde is extraordinarily accurate with a false rejection rate of 0.01% and a false acceptance rate of less than 0.00008%. Aplana Software was contracted by TDSi to develop the software for the PalmGarde reader. TDSi were responsible for commissioning the project, project management, generation of product specifications and final testing of the software. “The professionalism and knowledge off Aplana’s Specialists is very high. They exceeded my expectations on the project. They were very open at all stages and offered suggested changes to improve the product as development progressed. The project management was exceptional and they kept us informed of what they were doing at every step of the project,” says Mike Sussman, Engineering & Operations Director, TDSi. “We’ve been impressed about how quickly the team at Aplana began to think about our products and our business not from our point of view but from a user’s perspective. Many companies are reluctant to allow third parties to write software for them because they feel they might loose control or not have the right focus from the third party software house. This just was not an issue with TDSi’s experience with working with Aplana,” adds John Davies, Managing Director, TDSi. TDSi is one of the UK’s leading access control companies offering a range of controllers, readers and software. They combine outstanding performance and ease of installation, ensuring effective building management and control. Aplana is a rapidly growing Moscow-based software services company, a member of Russian technology group I.T.Co. Aplana provides high quality software services for global customers confirmed by ISO 9001:2000 certification.